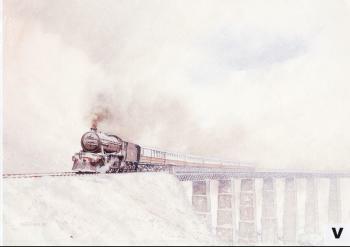 Battling through the snow Class K4 2-6-0 No. 61994 The Great Marquess rolls off one of the West Highland Line's many graceful viaducts with a Glasgow (Queen Street) to Fort William train in the mid-1950s. The West Highland Line is one of a quartet of superbly scenic Scottish routes whose recent chequered lives have mirrored the changing fortunes of the long distance country railway over the past 40 years. All four were leading placid existences up to the early 1960s, unchanging landmarks in a changeless landscape. Then the bombshell dropped with the publication of The Reshaping of British Railways - the Beeching Report - in 1963. Two routes - the Far North line from Inverness to Wick and Thurso, and the Skye line from Inverness to Kyle of Lochalsh - were proposed for complete closure. The central and highly scenic section of the Oban line between Dunblane and Crianlarich was to go, with trains being diverted on to the southern half of the West Highland. On the West Highland extension from Fort William to Mallaig stopping trains would be withdrawn and the local stations closed. It has been touch and go over the years, and the battles have been long and hard, but with only one exception those lines are still there. A matter of weeks before it was due to close anyway, nature had the last word on the Dunblane to Crianlarich section of the Oban line when a rockfall at Glen Ogle shut it prematurely in September 1965. But you can still get to Oban, and Wick and Thurso and Kyle and Fort William and Mallaig. Every summer a new generation of tourists crowd the trains. In their jeans and backpacks they are perhaps not as well dressed as the Victorian sightseers who first gaped at the romantic landscapes which parade by the carriage window, but to be sure they are no less appreciative of the majesty on offer for the price of a train ticket. Some of the stock used on the trains is a little tired now - the neglected child of years of indecision - and new Sprinter diesels will soon replace it. A more welcome echo of the past has returned, however, and steam locomotives have made a triumphant comeback running each summer between Fort William and Mallaig. One day perhaps The Great Marquess will return to the West Highlands too, as so many Scots exiles have done before, for it is its natural home. The K4s were excellent examples of a small, non-standard class of locomotive built for a specific purpose. Six were constructed in 1937-9 exclusively for the West Highland, and all given the highly evocative names of local Clan Chiefs. Small wheeled and very powerful, they were tailored exactly for slow, hard slogging around the heavily graded, tightly curved line. Replaced by diesels at the end of the 1950s the K4s eked out their days on coal and local passenger trains in Fife. No. 61994 survived to be last and after withdrawal in 1961 was bought for preservation. At present it is far from home, undergoing restoration on the Severn Valley Railway in Shropshire. But surely its heart is in the West Highlands.